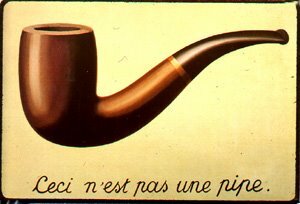 "This is not a pipe" declares Magritte, the painter. That's what the french words at the bottom say. And it's true. That is not a pipe. That's just a painting of a pipe. Guess Foucault agrees. aye...someone should have told that to him and spared all of us!